Are Lab-Grown Meats Really the Future of Food? Technology and cuisine are teaming up. Technology is teaming up with cuisine to provide realistic alternatives to meat, and the first prototype products are starting to interest consumers. Mimicking the taste, texture, look, and smell of meat isn’t easy, and creating these first few products demands a significant investment from companies. However, more companies are taking a chance on synthetic meats, hoping for major returns in the long run. In 2016, Beyond Meat became, arguably, the first startup to bring a plant-based meat alternative — one that could really stand in for real meat — to grocery stores. Impossible Foods, its main competitor, is instead approaching restaurants first with the intention of penetrating the grocery market later. Other companies are literally growing synthetic meats, called “cellular-agriculture meats,” fiber by fiber in labs. These are extremely expensive to produce, but their prices are falling fast. 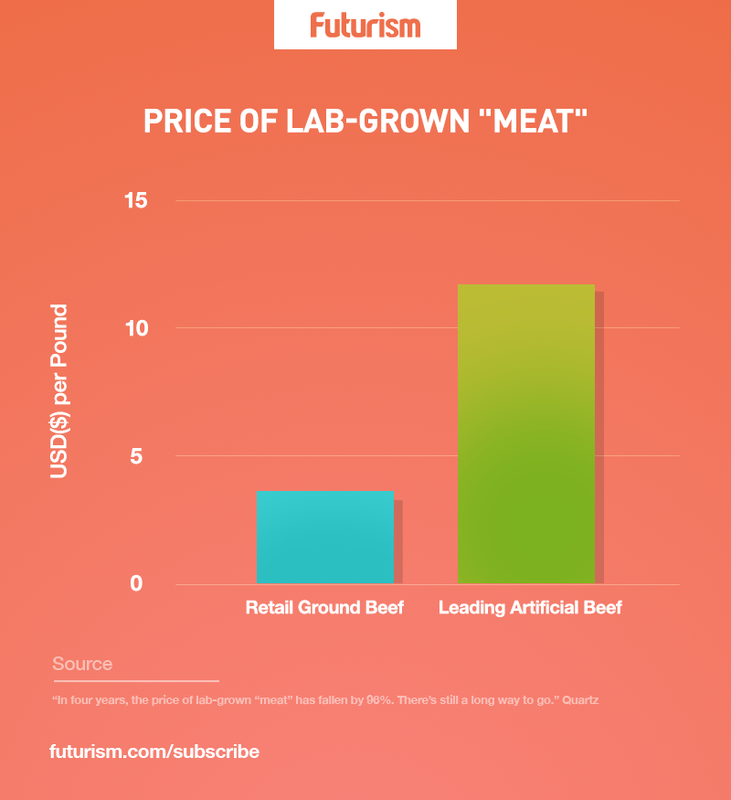 The price of the first lab-grown beef burger, created by Mosa Meats, was equivalent to about $1.2 million per pound, retail. Now, lab-grown hamburger runs for about $11.36 per pound, similar to the Beyond Meat alternative which goes for about $12 per pound — although both are still out of reach for most consumers. In contrast, ground beef retails for around $3.54 per pound on average. Meanwhile, Memphis Meats is currently in the process of growing chicken meat in the lab. Although comparatively, its retail price of $6,000 per pound is much more accessible than $1.2 million, it still has a way to go before it will be attainable for consumers. According to the Food and Agriculture Organization of the United Nations (FAO), livestock feed production eats up 26% of the ice-free land on Earth, and 13 billion hectares (32.1 billion acres) of forest are lost to land conversion for pastures or cropland annually. Livestock farming also contributes to about 14.5% of all anthropogenic greenhouse gas emissions. All of this damage could be alleviated by transitioning to lab-grown meats. Scaling — the ability to consistently meet demand in a cost-effective way — is the main problem holding lab-grown meats back. Although companies are working toward solutions, animal-free meat will not be affordable for average consumers before 2020. Still, Impossible Foods CEO Patrick Brown aims to completely replace the meat industry by producing more realistic meat alternatives with products like whole turkeys, and companies like Tyson are investing in his idea. For now, that’s just a pipe dream, but if lab-made and plant-based meats can prove to be friendlier to the environment, healthier, and cost effective, they might just have a fighting chance.